nForce 500: nForce4 on Steroids? NVIDIA puts on a very good Editor's Day, and this year's event to launch nForce5 was no exception. We had already seen, tested, and reported on late AM2 samples in AMD Socket-AM2 Performance Preview and First Look: AM2 DDR2 vs. 939 DDR Performance. This just meant we visited NVIDIA with pretty low expectations for the launch of AM2. We already knew performance was about the same as Socket 939. We knew the huge memory bandwidth increases for DDR2 on Socket AM2 were very real, but we also had already discovered that the extra memory bandwidth just didn't increase the performance of AM2 at this time. What we did not know at that point was the ambitious plans NVIDIA had for their new nForce 500 chipset - in particular the flagship 590. We weren't expecting much, but NVIDIA's marketing and engineering personnel were prepared to change our minds with new, exciting features like LinkBoost, SLI Memory, completely reworked networking capabilities, chipset support for 6 SATA drives (including 2 simultaneous RAID 5 arrays), and new or updated software like nTune 5.0 that allowed tweaking and overclocking in Windows with the ability to save Windows changes to BIOS. It is Marketing and Public Relation's job to impress and shape the message. We were prepared to be uninspired and unimpressed, but NVIDIA won us over, as they often do. That, after all, is the reason companies have events like Editor's Day. On the way back home we were thinking about NVIDIA's climb in the chipset market. It has been almost five years since NVIDIA launched the original nForce platform into an AMD market that was being dominated by the VIA KT266A chipset. It took a gutsy video card manufacturer to think they could topple the mighty VIA of that time. The original nForce chipset introduced several new technologies into the AMD market such as a dual-channel memory controller, built-in Ethernet controller, SoundStorm audio solution, DASP memory enhancements, and relatively fast (for the time) integrated graphics, GeForce2 MX for the IGP version. While the nForce met with some growing pain issues revolving around the IDE/Sound drivers, lack of a PCI/AGP lock, along with not matching the speed of the VIA KT266A at times, it was generally considered a successful venture for a new chipset maker. In the fall of 2002 NVIDIA rolled out their update for the nForce, appropriately named the nForce2. The nForce2 was touted to fix all the little things wrong with nForce, and the release also included separate MPC (Southbridge) units with the MCP-T featuring the SoundStorm audio processor and dual 100Mbit Ethernet NICs and MCP-P featuring a single 100Mbit NIC along with AC'97 audio. The nForce2 also provided a PCI/AGP lock that greatly improved its overclocking capabilities along with an updated integrated graphics version featuring the GeForce4 MX. In 2003, NVIDIA released an updated version of the nForce2 called the nForce2 Ultra 400 that featured an increase in the front side bus from 166MHz to 200MHz along with official PC-3200 DDR support. 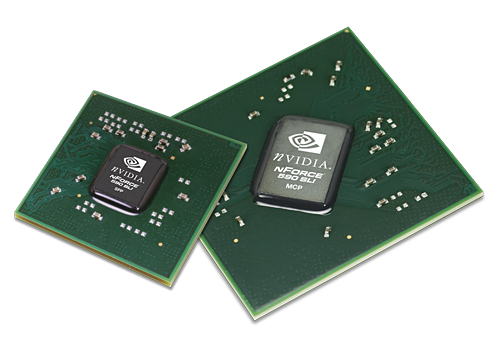 The nForce2 family was a huge success and NVIDIA was finding itself moving quickly from new kid on the chipset block to market leader. In the fall of 2003 NVIDIA introduced their new nForce3-150 chipset in order to meet the introduction of the new AMD Athlon 64 processor series. The chipset was obviously rushed as NVIDIA temporarily lost the feature war to the VIA K8T800 and was widely criticized for a 600MHz HyperTransport interface along with the removal of a now mature SoundStorm audio solution. In the spring of 2004 NIVIDIA responded with the nForce3-250 that featured a HyperTransport frequency of 800MHz, on-chip Gigabit Ethernet, SATA RAID support, 8 USB 2.0 ports, and a general refinement that was not found on other boards of the time. In October of 2004 NVIDIA introduced the family of nForce4 products that fully supported the new PCI Express standard. This family has grown over the last 18 months to include SLI technology, SATA 3Gb/s support, additional USB ports, ActiveArmor network engine, and even an Intel version of the product family. The nForce4 family has been the dominant market leader for the AMD Athlon64 series for a long time and just recently has met with serious competition from another video card maker. That's quite a history for 5 short years. NVIDIA has moved from the audacious video card maker who introduced a new platform chipset to the market leader in the AMD Athlon64 universe, and they have won that battle with innovative products and listening to their customers. Of course, today another video card maker is trying hard to win over the same enthusiasts. So how does NVIDIA respond to a lackluster new AM2 processor? The answer is with a huge marketing bang. NVIDIA has pulled out all the stops in an effort to win users over and grab some sales before the "big C" hits in July. NVIDIA is introducing the nForce 500 product family that features full support for the new AMD AM2 processor series along with a bevy of features. Some of these features are new, some address issues with the nForce4, and some are preparing us for future options in NVIDIA's products. Let's see what these new features are and how they perform against the latest nForce4 platform. Do the glitzy new nForce 500 features deliver where it counts - in improved performance? Or is this just another round of incremental improvements - and clever marketing? I'm a little tired of hearing about so-called "chipset" hardware RAID. The writer of this article constantly made it seem that it was the chipset that was responsible for performing RAID operations on the disks, whereas nothing could be farther from the truth. Yes, the chipset may offload some of the work, but (in the case of RAID 5) the major calculations, like the XOR calculations, are done by the host processor. According to [L]http://linuxmafia.com/faq/Hardware/sata.html#faker...[/L] and [L]http://spamaps.org/raidtests.php[/L], Linux-based software raid is much faster than so-called fakeraid, since it has been optimised and developed more than the software drivers of the fakeraid chipsets. Anyway, just pointing out something that gets on my nerves a bit. "In fact, the less than stellar write performance of the nForce4 in RAID 5 continues in the "new" chipset"
It does mean that the write performance is good or not? Well, but it does say precisely right about the whole AM2 transition. This is the most pointless hardware upgrade I've seen forfew last years. The only significant advantage of AM2 is a bit more featured mainboard. And you pay more for less speed. I think AMD is on the way down and no K8L can save them, cause it will be quad core only. What typical user needs quad core for price AMD keeps (like their pricing for current X2 CPU's versus Intel's). Gary, what's about that QoS network driver/protocol hanging around in my WinXP for years? I heard it does some quality of service stuff/packet prioritizing/etc soo... is FirstPacket just an interface for this Microsoft QoS thing? Or is nVidia didn't know about it and reinvented the wheel?